GOODS and Services Tax (GST) collections touched Rs 11.77 lakh crore in fiscal 2018-19, exceeding the revised budget estimates, with record realisation of Rs 1.06 lakh crore in March alone. March saw the highest ever monthly return filing since GST rollout on July 1, 2017, at 75.95 lakh-- reflecting improved compliance. Meanwhile, Finance Minister Arun Jaitley in a tweet said “The record collection in March, 2019 of the GST touching Rs 1,06,577 crore indicates the expansion in both manufacturing and consumption”. In a statement, the Finance Ministry said the monthly average of GST revenue during 2018-19 is Rs 98,114 crore, 9.2 per cent higher than the previous fiscal. “These figures indicate that the revenue growth has been picking up in recent months, despite various rate rationalisation measures,” it said. Total gross GST revenue collected in March, 2019 stood at Rs 1,06,577 crore of which central GST was Rs 20,353 crore, State GST was Rs 27,520 crore, integrated GST was Rs 50,418 crore and cess was Rs 8,286 crore. 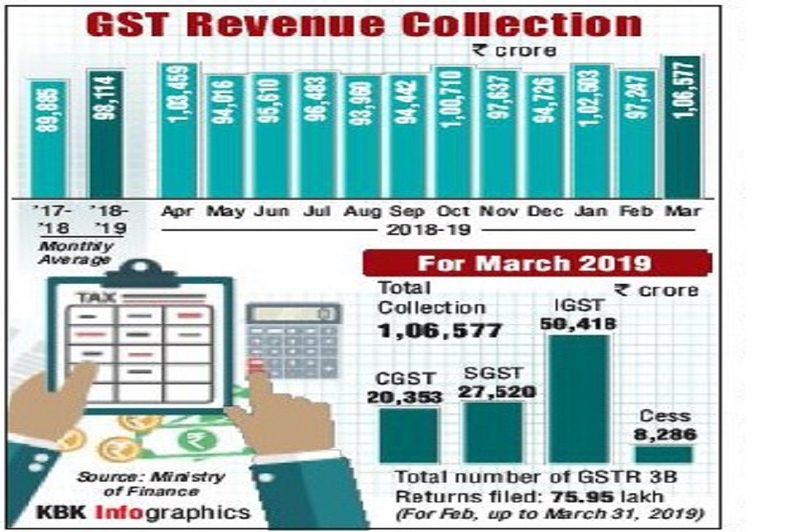 The collection in March, 2019, has been highest since introduction of GST and the fourth instance of the mop-up breaching the Rs one lakh crore mark in 2018-19 fiscal which ended on March 31, 2019. The March, 2019, collections also reflects a 15.6 per cent growth over March, 2018, collection of Rs 92,167 crore. The total collections during 2018-19 fiscal totalled a little over Rs 11.77 lakh crore, which was higher than Rs 11.47 lakh crore set in the revised budget estimates. GST collection stood at Rs 1.03 lakh crore in April, Rs 94,016 crore in May, Rs 95,610 crore in June, Rs 96,483 crore in July, Rs 93,960 crore in August, Rs 94,442 crore in September, Rs 1,00,710 crore in October, Rs 97,637 crore in November, Rs 94,725 crore in December 2018, Rs 1.02 lakh crore in January 2019, Rs 97,247 crore in February 2019 and Rs 1.06 lakh crore in March 2019.